Big news on the potty training front! At her request, Kay has spent a large part of the last three days in big kid underwear. I expect that it will take a little while longer for her to be potty trained at night, but we’re clearly at the end of our cloth diapering days. Of course I’m excited for her – she positively beams with pride every time she goes on the potty – but a big part of me is sad to say good bye to this stage. My baby is growing up so fast! All this has gotten me reminiscing about about the last five and a half years and how we got started with cloth diapers. My first exposure to cloth diapers was back in the early 80s. My baby brother was in part-time cloth and disposables, and I used to help my mother change his diapers. I still remember shaking out those huge birdseye cotton flats, folding them into a big kite for my mother, and handing them to her along with the safety pins and plastic pants to keep everything waterproof. She kept the dirty diapers in a big blue plastic bucket full of stinky water. Yuck. Even so, long before having babies I knew that I wanted to use cloth diapers. It just made sense. The average baby will require 6000 or more diaper changes. That’s a lot of trash in the landfill and thousands of dollars thrown away. That’s a lot of toxic chemicals (e.g., xylene, ethyl benzene, styrene, tributyl-TIN, isopropylene, dioxins), plastics, adhesives, elastics, and lubricants right up against my baby’s delicate skin and reproductive organs, around the clock for the first two to three years of her life. Not only are cloth diapers safer, more economical, and more environmentally friendly, they’re just so much cuter than cheap paper and gel-filled diapers! Just before we got married, hubby-to-be’s sister had an adorable baby girl. 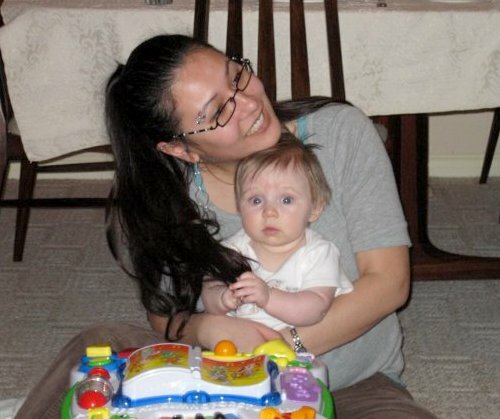 She used Mother-ease fitted diapers and Airflow covers on her little one. The first time I changed my niece’s diaper I realized what a big step up these were from what I was used to. This seemed totally doable. And then when we were expecting our first, I started looking into what kind of diapers I should use. I had a few of those Mother-ease fitted diapers handed down from my sister-in-law, but some had been sold in the intervening years and I knew I would need more. Even five years ago, the cloth diapering landscape was dramatically different than it is today. Back then it seemed like there were so many choices – flats, prefolds, fitteds, pockets, AIOs – but compared to the number of brands and designs available now, it really wasn’t. Back then, cloth diapers were just starting to get more notice and becoming more mainstream. I decided to go with the most economical option: prefolds and covers. Five and a half years ago, my first little girl was born. I used disposables for her first few days (I was afraid of meconium, but now I know better) then transitioned to Bummis prefolds and Super-Brite covers for the next eight months or so. I slowly added used diapers here and there, but Tee was still mostly in prefolds. It was a revelation when I started using pocket diapers full time. They were so easy! And the cute prints! Any cloth diapering mama will tell you how hard it is to resist buying all the colours and adorable prints, even when the last thing you need is more diapers. And then I discovered I could win cloth diapers. This was a whole new ballgame! In the course of reading cloth diaper blogs and entering cloth diaper giveaways, I learned so much about the growing cloth diaper scene. 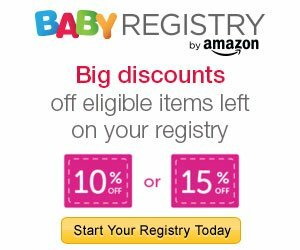 I discovered there was a whole community of like-minded mamas out there. Mamas who used cloth, who wore their babies, who co-slept, who tried to reduce their family’s reliance on disposable products. I’d never had such a community before. When my second baby came along, her very first diaper was a mint Fuzzibunz Perfect Size X-Small. Yep, that’s hubby putting it on her. Daddies love cloth diapers too! This time around, I was an old hand at cloth diapers. Meconium? Shmeconium! That’s what liners are for! 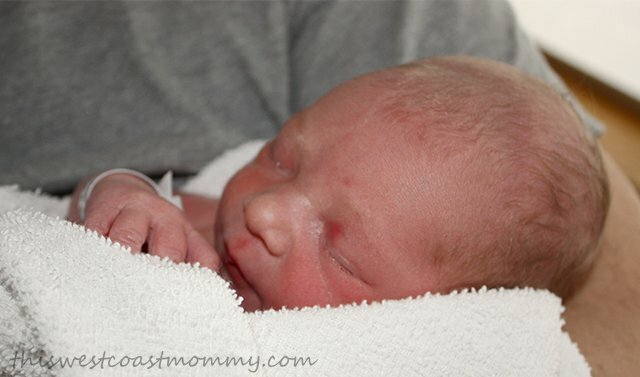 This time I had a handful of newborn pocket diapers that I used in rotation with my faithful Bummis prefolds. When Kay was about four months old, I switched to my one size pockets during the day and fitteds at night, and that’s what we’ve been using since. When I made the decision to quit my job as a psychiatric social worker and stay home with my then one-year-old and three-year-old daughters, I decided I needed another outlet to avoid slowly going mad. I decided to start a blog. 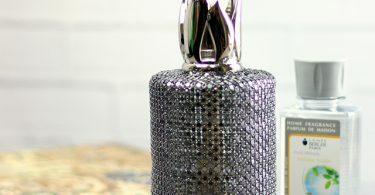 This one, in fact! I knew from the start that I wanted to take on an active role in my cloth diapering community. I knew I wanted to talk about (and give away) cloth diapers on this hypothetical new blog. My journey is why I talk about cloth diapers on my blog and in real life. That’s why I put my kids in their cutest cloth in hopes that someone might see and ask about it. Knowing someone who uses cloth is one of the most powerful endorsements for a new or expecting parent. So show off your fluff and let’s make cloth mainstream! 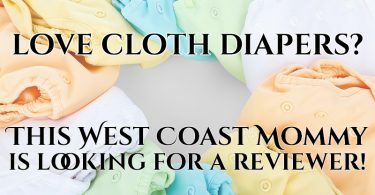 This West Coast Mommy is Looking for a Cloth Diaper Reviewer! Yes my diapering days were like your mums. At some point during my diapering years thin plastic wraps came out, so then I folded my cloth diapers into oblongs to insert into them (no pockets though). When I see how beautiful diapers are today I wish I’d have had such lovely ones for my children. We’re in the midst of potty training my 25 month old. He’s potty trained in the house but not over night or if we have to go anywhere during the day. I just found out this morning that I’m pregnant with rainbow baby #2, and we’ve never cloth diapered a nb. We started about 6 weeks. But I’ve got a small stash of nb cloth diapers now i’m excited to use!